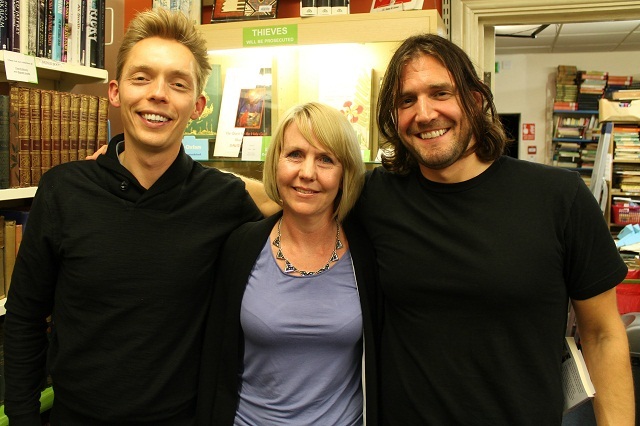 So on Friday evening I caught up with The Minimalists. City 87 out of their 100 city worldwide tour and Joshua Fields Millburn and Ryan Nicodemus have arrived but not to a minimal audience. I'm not the lonesome mimimalist in the Midlands then... thank goodness for that. The long narrow bookshop in Birmingham quickly fills up. Quiet anticipation captivates the room as we browse the bookshelves but not for long. “You're all here for the same reason aren't you? Then talk to each other!”, we're instructed by the effervescent host representing Oxfam's bijou bookshop in King's Heath, Birmingham. In true Brit fashion we do as we're told, drop our guard and suddenly the atmosphere becomes snug as conversations circulate candidly. Ryan Nicodemus opened The Minimalists talk inviting us to imagine a more meaningful life in the future. He spoke of his discontent as a twenty something corporate professional trapped by apparent success and how he and his friend Joshua unwittingly discovered minimalism. Joshua Fields Millburn then took to the floor, reading an extract from their book Everything That Remains. Intimate details of personal narrative followed describing the mindless shopping spree of a new homeowner in the world's largest furniture store. Something many of us can identify with. The best part of their presentation was, for me, the question and answer session. With wisdom, humour and without judgement they answered a range of questions from, “How many bicycles should a minimalist own?” to, “How do I get rid of things I might regret giving up?” There were too many questions and not enough time; the interest and consciousness of minimalism was tangible. The evening ended with warm hugs from Joshua and Ryan, books were bought and signed and the crowd waited happily for their turn. I had a wonderful evening. Seeing and hearing The Minimalists in person, meeting like minded people and chatting to a few Just a little less readers left me feeling very inspired. Thank you to anyone I spoke to or who emailed me about the event. The buzz from the bookshop was palpable and as we wandered back down the street to our car we were asked by a passer by, “So, what was going on in the bookshop?” “Oh, two American guys called The Minimalists giving a talk” we answered and he nodded disappointingly. People were turned away. Sorry you missed it. Claire what a wonderful evening you had with Joshua and Ryan and some of your own followers too! It's good that you've been posting photos of yourself lately so you could be recognised :) I would also have liked to meet up with you in person but fortunately the internet allows like minded people to communicate with each other as well. It sounds like a brilliant evening. I love your blog and I admire what you've done, but I am in two minds about the Minimalists. I don't claim to know all about them, just my impression from their blog is that they are two intelligent, well-educated guys (dare I say privileged?) who have no other responsibilities but themselves. We don't all have six figure salaries to give up - a lot of people scrape by on what they earn (and some people can't work at all) and we can't all sell our houses to simplify our lives. Sometimes I wish I could walk away from my responsibilities but is only ever a brief daydream. What would happen if brain surgeons all decided to give up their jobs to be more at peace with themselves? Like the book Eat, Pray, Love there is a whiff of self-indulgence in there, like Marie Antoinette famously playing at being a shepherdess. But perhaps I am being too judgemental? Thank you for your kind words and for sharing your views. As The Minimalists is one of the newer American blogs on minimalism I didn't know that much about them either until recently. They are certainly intelligent though not necessarily educated to degree level (this is not a judgement). Although they had outward success at a young age they were living beyond their means. I agree that they are privileged compared to some in being able to choose a simpler lifestyle but I know many people who long for simplicity in their lives and could live on less but are not prepared to give up certain aspects of their lifestyle. I find this sad as I once felt trapped by a salary and lifestyle too. The Minimalists, Ilona from Life After Money and countless other people, who through choice or circumstance, live on reduced budgets are all inspiring to me. There are plenty of people living minimalist lives in different ways and for different reasons. As you say there are many variations of the "minimalist" lifestyle and many reasons that people are" simplifying". In some cases it does mean that people decide to work part-time and for others it may be to change job or career. However I've never heard or read Joshua or Ryan or any other minimalist blogger advocate giving up a job on a whim or advising that this is the only answer to a happy life. The idea is to examine one's own life and possessions, decide what is really necessary and not be unduly influenced by advertising and the lives and possessions of others. This is not a new idea of course but is often harder to do today in the consumerist Western society. Also, as Ilona and all the minimalist bloggers are saying in their own ways - don't spend more than you earn. I just watched their Tedx talk, it was good. Interesting guys, I would have liked to have met them.